Solaris, Vails premier residences, is now available for vacation rentals featuring premium accommodations and service at an ideal location in the center of Vail Village. Solaris services includes 24 hour desk and can offer guests to fully customize their holiday experience with a personal assistant program. They are there to arrange and coordinate individual and family needs; from spa and restaurant reservation, summer and winter vacation packages and shuttle services. Solaris also provides fitness and exercise facility, heated indoor pool and hot tub, laundry service, and twice daily housekeeping. During ski season, there is a complimentary morning coffee and pastries and complimentary apre cocoa and cookies. Solaris is located at the Heart of Vail Village just steps from the lift and offers a five-star accommodations and amenities. The shops at Solaris include ice skating rink, bowling alley, movie theatre, shopping and dining. Their valet and bell desk provides slope-side ski valet and ski lockers at Gondola 1(formally Vista Bahn). Solaris Plaza can cater to family-friendly activity at Bol and Cine Bistro. Bol is a posh hot spot for bowling and dining. Solaris guests can reserve lanes before the general public. Cine Bistro is a modernistic movie theater. All guests that arrive 30 minutes early can have dinner and cocktails delivered to their seat! Furthermore well acclaimed Chef Matsuhisa Nobu created his exquisite establishment Matsuhisa, where sushi is an art form. Matsuhisa is where foodies and others can relax and dine creative appetizing dishes. All residential properties are fully furnished and the lay out consist of stone fire place, hardwood floors, cherry finished doors, deluxe kitchen and posh baths. All rooms have complimentary wireless internet, climate-controlled wine storage and home automation. The Creston home automation is a little box on the wall that lets guests control the light fixtures, blinds and contact valet service. It also lets you access nine mountain cams that shed light on lift lines, snow quality, weather and crowds. 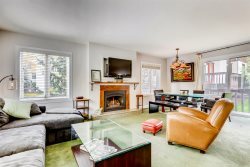 A widespread 2350 square feet 3 bedroom plus den can occupy up to eight people. The master bedroom has a king bed and a beautiful bathroom with jetted tub. The second bedroom either has a king bed; and the third bedroom has a queen bed; both rooms have full bathrooms. The cater-ready kitchen provides a SUB-ZERO and WOLF appliances and a spacious dining area comfortably seats 6 plus 3 at the bar.